I don't know about you, but I find pillows as a huge essential to get substantial beauty sleep that you need on a daily basis. Like legit, think about the last time you slept in a hotel which easily got you to doze off within seconds. So yes, this is my way to justify that pillows play a huge role for bedtime. The only thing is that most hotel pillows are usually crazy expensive that I struggle to find good pillows that are affordable. Thankfully, I found out about Leyna just recently and quickly took the opportunity to get my hands on it because it was insanely affordable for a high-quality pillow. What makes Leyna pillows so different than other pillows? Well, let's start with the value of the brand. The brand believes that they can provide comfortable pillows at a lower rate and claims that instead of buying 4 pillows for a queen size bed, you’ll only need 2 just to get the pillow at the height you want. Did you know that it's important to get a pillow that is not too soft as it would strain your neck muscles and decrease the blood flow to your head? With that in mind, I’ll be sharing with you a review of my experience of using Leyna Pillows for the past 1 month. Do you see that? Its made in Malaysia! Upon receiving the pillow, I was in shock that it's received it in a flat vacuumed bag. Nothing to worry about as the vacuumed bag is only for easy storage and so that its easy to send for shipping. Hehe. Once you cut the bag open, the pillow would automatically expand on its own and its ready to be used after a few fluffs just so that you get the pillow in shape. I store extra's at home, just in case I need a new batch. So yeap, it saves me space and also gives the assurance of ensuring that I'll forever have an extra pillow in store. In case you havent noticed, the pillow has an exclusive printed design on the pillow, giving you the option to use it as it is without a pillow case. It really depends on how you’d like to use the pillow, but personally, I believe the reason to this is so that when the pillow used without a pillowcase, it would encourage you to wash your pillow more frequently. Honestly, when was the last time you washed your pillow right? Haha. Don't worry guys! Im guilty too! Find it too thick? Don't worry, there's a zip at the side! An actual verdict, I would have to say that RM39 for 1 Leyna pillow, it's actually pretty good! The quality is the kind that would last you for years till you buy your next pillow. So far I took out the fiber cotton cause it eventually felt a little too high, but im happy that its flexible in a way that you can remove the cotton fibers when needed. There's one time, I got back home and just laid down on the bed with this pillow on my head and within 10 seconds, I dozed off! I usually have problems sleeping, but ever since I used the pillow I had no insomnia problems throughout the night. Even my cat loves this pillow too! At only RM39/each, I think its a steal deal for head support! As an overall conclusion, i have not regretted getting two Leyna pillows as it pretty much solved my insomnia nights. I honestly don't know what made this pillow so different, but i suspect that the support is good thus giving me better sleeping experience. If you’d like to know more about Leyna, please feel free to ask me any question or just leave a comment below. Hehe that's all for now. I know that i can go on and on and on, but i’ll keep this short cause its definitely recommended if youre looking for a pillow that provides good head support that assured you with comfort and a good night sleep. Recently consuming BLACKMORES 10,000mg high strength collagen, and of course, when you're dating a pharmacist, you get pretty caught up with the type of skin care that you use and don't get me started about the supplements that you consider taking to maintain the health of your skin. 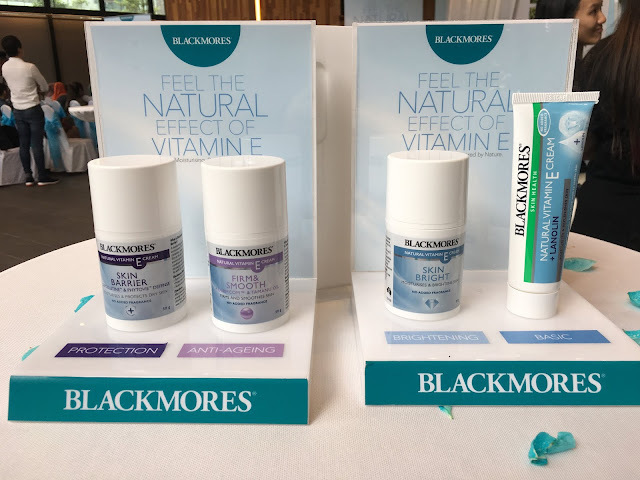 Walking by Watsons the other day, I couldn't help but notice that Blackmores now has a skincare range targetted to provide your skin with Vitamin E. What is vitamin E? Vitamin E helps the skin to fight off radicals and at the same time reduce wrinkles to keep the skin looking youthful. If you're here to find out 'How to take care of your skin', well, with Blackmores Vitamin E would be one of your solutions! When was the last time you got your skin checked? Did you know that the skin can regenerate itself every 27 days? Living in a world with harsh environments and nutrient deficiencies can create an impact on the structure and function of the skin which may contribute to skin issues. Personally, I prefer going for natural supplements such as BLACKMORES to boost the collagen level in my skin, and now with their high-quality natural skincare, BLACKMORES Natural Vitamin E Cream range, it can help moisturize, protect, nourish, and soothe the skin by preventing moisture loss. With the basic ingredients containing vitamin E together with lanolin, avocado oil, apricot kernel oil and Vitamin A, each having its own functions to protect and restore the skin. It also has no artificial colors or fragrances being added to the product. Now let's get into details starting the BLACKMORES Natural Vitamin E Cream + Lanolin. This cream is a rich and soothing cream which helps to deeply moisturize and protect dry skin. Containing natural sources of vitamin E, 7% natural lanolin, avocado oil, apricot kernel oil and vitamin A, this cream helps prevent moisture loss by locking moisture into the skin and is suitable for both body and face. Great for everyday use and also as a very versatile moisturizer in any situation. Targetting more detailed skin issues, if you're looking to achieve a brighter glowy skin, the BLACKMORES Natural Vitamin E Cream Skin Bright helps to moisturize and promote radiant skin. It contains antioxidants (licorice root extract, glabridin, wakame seaweed extract, vitamin E) which help to promote the appearance of a brighter complexion while vitamin A and oils of avocado and apricot kernel help to nourish and smoothen the skin. Next would be a cream that would protect you when you're outdoors, the BLACKMORES Natural Vitamin E Cream Skin Barrier helps to protect the skin from the harsh environment and hydrates and softens the skin. This is a protective and hydrating cream blended with nourishing plant-derived oils containing omega-6 and omega-9 fatty acids that form a film on the skin, providing a layer of protection from environmental pollutants with added DepollutineTM (moisturising algae) and PhytovieTM (a copolymer conditioning oils that help to provide a barrier to environmental pollutants). And last but not lest would be the BLACKMORES Natural Vitamin E Cream Firm & Smooth helps moisturize and firm the skin and reduce the appearance of fine wrinkles. This cream is perfect to compliment your current anti-aging skincare as it contains DermcomTM that features Crocus crysanthus (snow crocus) bulb extract which improves skin firmness and skin elasticity, and Tamanu (Calophyllum inophyllum) seed oil that contains fatty acids (including calophyllic acid) which are emollient and function to fill in the fine lines, increase skin softness and smoothness, and improve the overall appearance of skin. Mandatory photo with this pretty backdrop! The BLACKMORES Vitamin E Cream range has been very popular overseas and I remember I had times where I had to purchase a few tubes and pumps of this specific range as requested by friends when im traveling. Well, guys, GOOD NEWS cause it's finally available in Malaysia! The BLACKMORES Natural Vitamin E Cream range is currently available exclusively in all Watsons Malaysia stores! So if you happen to be in Watsons, don't forget to check out this new collection out where the BLACKMORES Natural Vitamin E Cream + Lanolin retails at RM 35.00 for its single tube and the range of facial moisturizers retails at RM 65.00 for each pump bottle. Can't wait to get a bottle for myself to try it out! Shall I do a personal review on this? Leave me a comment below. Whaddup guys! Its that time of the month where I decide to change and test out a new skincare range to see if it works on targetting specifically dark spots and pigmentation on my skin. Having combination skin to deal with on an everyday basis, my biggest concerns are usually acne or dark spots/ pigmentation since I always love being under the sun (guilty as charged). I'd say that if you know what your lifestyle is like, it's always best to understand your skins need before picking the right skincare. And as much as I want to focus more on hydration, whitening, and repairing, my advice is to have a skincare ranges that targets your main concern first, thus leading me to try out the Nanowhite skincare range. Got my Nanowhite Dark Spot & pigmentations set! The highlight of it all would be that I found myself stumbling upon the Nanowhite Dark Spot Corrective Serum which I believe its a new addition to the Nanowhite skincare family. And since my current cleanser, toner and moisturizer are out, why not get the whole range instead?! So here it is! With all these skincare, im hoping that it would at least reduce my pigmentation worries by using the complete set which consists of the cleanser, toner, serum, and moisturizer. So let's get into details! Foams up pretty well, and since this is the upgraded version, its definitely genlte on the skin. Starting off with the cleanser, this is no stranger to me as it used to be my cleanser during my teenage years. It pretty much helped to keep my skin looking like its glowing each time I go to school, all the way to my early university years. The plus note of this cleanser is that its suitable for all skin types and the best part, it moisturizes while it cleanses which means it won't give your skin that tight uncomfortable feeling after cleansing your face. I approve! Next would be the refining treatment toner, which helps to close up your pores and remove excess oil without drying the skin. Upon application, it usually would give my skin that refreshing feeling which is power-packed with HappyDermalogy, nano technology, Omega White C, Allantoin, Orange Extract, Lemon Extract and Bilberry Extract. I usually experience occasional tingling sensation on my skin if my skin has been exposed to the sun for too long, but after using it for about 3 weeks now, I believe that it helps to really close up the pores, preventing from dirt to have access to your pores. Comes in a fancy dropper bottle and i was so excited to see this in stores! And the highlight of the whole range (to me at least. hehe) would be the Dark Spot Corrective Serum which helps in reducing dark spots and pigmentation over time. I would believe that this is the highlight of it all which helped me in really reducing my dark spots on my face. LEGIT! 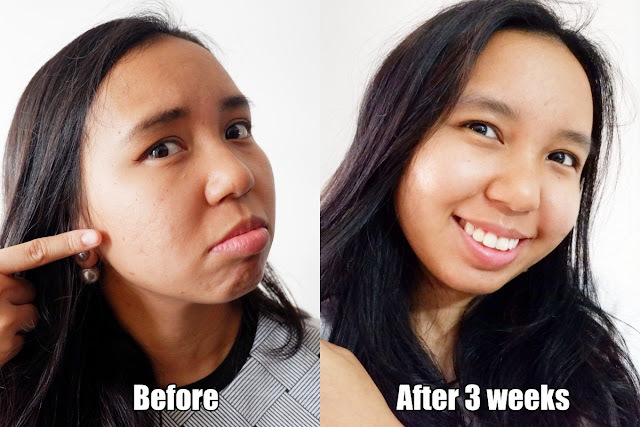 After 2 weeks of constantly using this serum, i'll be honest that the improvements arent that obvious, BUT, i noticed that it did very slightly tone down the darkness of my pigments by a good 30% since i've been only using it for about 3 weeks now. See, its because its easy to apply it on targetted areas too! It comes in a bottle which also has a dropper so that you can easily apply it on your skin at targetted areas. I like to really apply a sufficient amount around the areas with spots and trust me, over time you will see the difference. My skin condition was considered bad since I had breakouts that were bleeding to death. (LOL ok exaggerating), but after about a week of constantly using this, it kindda my breakouts to recover and now my breakout spot is smooth and even with very light marks. I may need to constantly use this for the next few weeks to really see the results, but so far so good. Im a satisfied nanowhite user! If you know me, you'll know that i like scooping my creams out with a spoon to keep the cream constantly fresh! I'll directly apply it to my face like so. Now, this had a very different reaction to my skin. Try to not over apply the amount to your skin as it has this tingling effect when applied too much as I think that the solution is slightly stronger than their other products. Thus, when using this, I would advise you to moderately use this when your skin finds this too strong. I don't think I can use this on a daily basis, so what I do is I'll apply this on for two days, then use a gentler cream on my skin to give it a rest from all the double action goodness and repeat with the application. It's only because my skin is suffering from breakouts, and that could be one of the reasons why I find it a little too strong. Possibly when my skin is breakout free, then maybe I can use this more often. Once my breakouts were gone, the tingling feeling eventually reduced. So what are my overall thoughts? As a verdict, I would have to say that the range is pretty convincing. It works like a charm without burning a hole in your pocket. I would also like to emphasize that you may need to be constant when using the range and also be patient with the results as I only started seeing obvious results after 2 weeks. Im not too sure if using just one product from the range would help in reducing dark spots, but to be on the safe side, I would advise you use the whole range as each product compliments each other. Honestly, im really happy with the range and the results it gave me. From the before after picture, I think you can tell on how much my skin has improved over time. Less visible spots and brighter glowy skin too! Im shook cause i wasnt expecting to be glowing as well! Well, that's all for now, and if you have any other questions, please feel free to holla at cho girl. Earlier this month, I had a great Sunday by spending my time at the Ginn International August Showcase that was a platform for me to explore into high levels of expositions of a variety of exclusive brands and businesses. But honestly the highlight of it all was that Ms. Ginnie Lam, The Ginn Artistry president was present, and believe it or not, this is my first time ever getting to meet her in person, which made it more beneficial for me to be present to such an exciting event. Other than getting to meet Ginnie Lam in person, the event presented 3 fashion & red-carpet worthy Runway Shows within the showcase. Attendees were able to witness the Ginn Artistry Fashion Show with Designer Evening Gowns by Glitter Venus & Ginn Int'l sponsored Jewellery. Presented by 12 of the most prominent Malaysian Beauty Queens and local top Models, they have been specially selected to be the Star Brand Influencers at this show. After the fashion show, we had a quick introduction by Professor Joh Hee Chul Jung who came all the way from Korea, he shared the trending of the next wave of Korean entertainment and beauty. So it was such a pleasure to be the first few to discover the latest technology being offered in the beauty industry. Not to forget that we also had a special appearance of the Top 6 Graduating Stewardesses and Steward from the Cabin Crew Academy KL (Subang Skypark) who managed to strut their way through the red carpet to flaunt their special Academy Uniform Parade. In conjunction with that, the CCA has appointed Ginnie Lam as the International Ambassador of Cabin Crew Academy KL to elevate the aviation in the hospitality industry. Halfway through the show, I noticed that the Emcee ushered Ms. Ginnie to the backstage (Here I got a little curious cause I was so tempted to get a photo a with her, but I guess the show has something special to offer). While waiting for the Showcase finale highlight, we were entertained by Ginns very own Operation Director, Mr. Derrick who shared the progressive journey of Ms. Ginnie Lam in Malaysia since becoming the Coffee & Tea Lifestyle Ambassador of the "Best Malaysian Café" Program in the year 2017. And by the time the talk ended, it was finally the prime highlight of the Showcase which presented Korean Senior Models Associations in Traditional Hanbok with their top 10 senior Korean Models showing off one of the finest designs of the latest Hanbok. It was absolutely stunning! But the minute we all saw Ginnie Lam herself making her way in an amazing Hanbok piece, I think almost everyone present was really impressed to see Ginnie in a fusion statement piece. It really had a touch of class blending both traditional and contemporary themes without losing its Korean cultural touch. Also managed to get my shot with the Miss Ginnie Lam herself! To end the showcase, we had Mr. Jo Hoi Kim who shared a short speech and gifted the showcase with its grand feather in the cap via the Official Appointment of Ms. Ginnie Lam as the International Ambassador of the Senior Models Association of Korea as well. After all, after looking at her in a Hanbok, I can see why she deserves the title. Wrapping up the afternoon, they presented a special video of Ginn Int'ls journey in a collaborative video while she was in Korea on the 11th of July 2018 for the Federation of Arts & Culture Korea (FACO Korea). She also gave a meaningful speech ending with tears sharing how happy she is to be able to inspire people to be beautiful on the inside and the outside. Moving towards a modern era, combining online e- commerce, online shopping, live broadcast and blockchain, the CANNIS APP covers daily basic needs like food, drink, entertainment, clothing, and stimulates a new wave of business models and drives the new wave of APP. Having its HQ in Kuala Lumpur, Malaysia, they have recently held a global launch conference at the Setia CityConvention and Exhibition Center ( SCCC ) on August 18, 2018. Now having offices in Taipei, Guangzhou, Hong Kong and Penang, with a technical team in Hangzhou, this marks the start of the most promising APP in 2018. The chairman of Cannis Group is Her Royal Highness Crown Princess, the sister of Sultan of the Selangor,Sultan Sharafuddin Idris Al-Haj, who has assisted hundreds of well known companies with very experienced corporate coaching experience. The Vice Chairman, Tan Sri Dato Sri Ong Tee Keat and the Chief Executive Officer is Datuk Dr. Azman Ching. Ong Tee Keat shared that the rapid growth of Chinese social media users, the penetration rate has increased remarkably, and the rise of the blockchain has overturned the current industry and social operation. Blockchain, artificial intelligence and the Internet are among the top three technologies that China needs to strengthen. As we all know, Live broadcast has begun its social networking in 2016 and the scale of China's online live broadcast was almost reaching approximately 58 billion yuan. The domestic analysis of China expects that the live broadcast industry will exceed 100 billion yuan in 2018. And between you and me, we can pretty much predict that the live broadcast has become a social phenomenon, and a commercial product to further analyse. With the revolution of the internet controlling the trend of the economy, it is regarded as a new technology that will replace the current network economy, in which will inevitably stimulate a new wave of business models, and Cannis will become a new era of Internet users, a compulsory App in smartphone. Since March earlier this year, Cannis has successively acquired technology companies including Internet, online games, mobile devices, and big data sharing, and at the same time, it has become a partner of Google, greatly improving the readability of Cannis APP, and its systemsecurity. This is legit massive stuff! Present during the launch, we hadAzman Chin who said that Cannis is the world's first fans and follower’s integration platform. Nowadays there is no need to download multiple apps, as long as you have Cannis, you can meet all the needs of fans. With the business philosophy of “u think it, we build it ”, it will build a social media with the most comprehensive application function, and create the most suitable ecological environment for enterprises and fans, and gather the global user database together. Cannis is not only a stage for talents, ambitions and dreams for ordinary people, the payment system created can be used in 140 countries around the world, especially in Southeast Asia. The main guests attending the conference included the technology, internet and blockchain industries, as well as leaders from the political and business circles, relevant industry associations in China, government agencies and related organizations. They are looking forward to the future development potential of Cannis APP. Cannis App It is available on google play store but not Apple Play store yet, so be sure to keep yourself updated with the app’s updates! To install, you may refer here, http://api.ickapay.com/download/index.html and follow the instructions there.